Why Are We Making It So Hard For the Chinese to Provide Us With Lower-Cost Aluminum? This WSJ article's hook is a huge cache of raw aluminum photographed in the Mexican desert. American aluminum manufacturers claim that this is Chinese aluminum being illegally transshipped through Mexico to get a lower tariff rate. The U.S. Commerce Department says it is investigating the Mexican aluminum’s origin as part of a slew of trade complaints by the U.S. metals industry against China, many of which include allegations of transshipping. 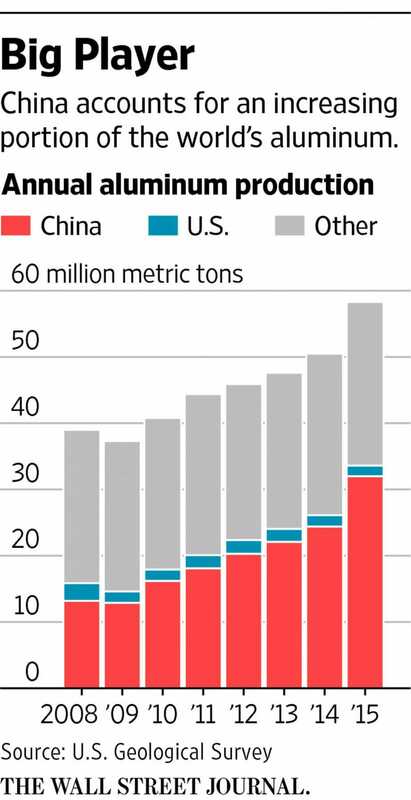 China’s booming industrial production has reordered global markets, few more dramatically than aluminum. Fueled by access to inexpensive electricity and tax breaks, Chinese aluminum output doubled between 2010 and 2015. With local demand slowing,more of it was sent to the U.S., which was importing 40% of its aluminum by 2015—up from only 14% in 2010. 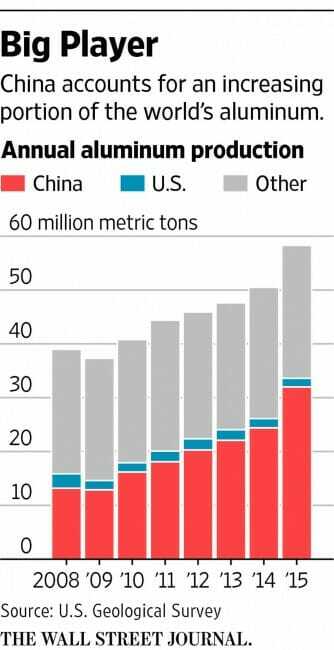 By the end of 2016, only five aluminum smelters will be operating in the U.S., down from 23 in 2000. Alcoa Inc., the largest American aluminum maker, is splitting in two, isolating its profitable parts-making units from its troubled raw-aluminum operations. Alcoa Chief Executive Klaus Kleinfeld last year said illegitimate Chinese exports were “the major driver” of lower aluminum prices. I suppose to an incumbent who has convinced himself that he has a God-given right to his historic market share, new sources of competition are always "illegitimate." But through the whole article I kept asking myself, why are we forcing these folks in China to jump through so many hoops just to bring us lower-cost aluminum? Given how fundamental aluminum is to almost every manufactured product today, we should be welcoming them as heroes, not forcing them to play silly games in the Mexican desert just to deliver their product at the price they want to sell it for. It turns out that all this government effort to "protect" us from lower cost aluminum is to support an American aluminum industry that is tiny, maybe 2% of world production. The industry would argue that the lower prices of Chinese imports are "illegitimate" in part because the sales price in the US is subsidized by Chinese taxpayers. To which I answer, "so what?" Or actually, to which I answer, "yay!" If another country's taxpayers want to pay higher taxes so that they can provide valuable raw materials to US industry at lower prices, why in the heck would we want to stop them?